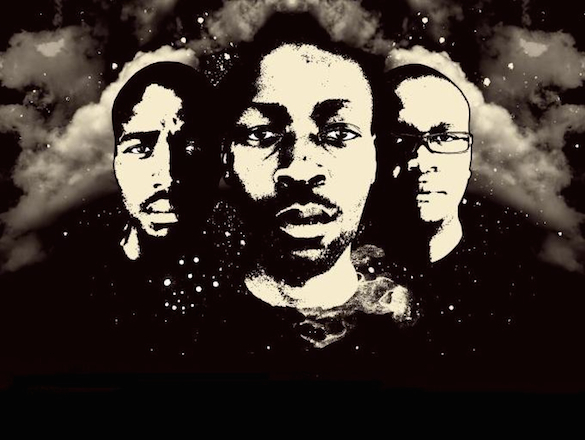 Hood Natives was originally formed in 2007 by Simphiwe Nkosi (Dj Fale) and Mthokozisi Buthelezi (Mr Edge), who were then joined by Phumlani Sokopo (Dj Sqway) and Lesego Sefako (Sir LSG) to form a Producer/DJ Crew and full on music music label. The South African group is also a fully functioning entertainment company, including artists, songwriters, producers, engineers and even music publishing. They have worked with the likes of Dj Cristos, Ralf Gum, Jonny Montana, Abicah Soul, Harrison Crump & Vinny da Vinci. We recorded the Baleka vocals in 2008 at our small home studio with Kamogelo “GI Bongo” Mashiane. When GI recorded his Vocals, all the guys in the studio laughed at him at the very distinctive chant voices he was making. At first we took the song lightly as just one of those songs, considering the quality of the vocal at the time. When the tune hit the streets it was well received by our peers. On our YFM interview with Legendary DJ Oskido on the Hot 99 show we were well praised by him and he kept saying he likes the Baleka song. 6 years later people still respond massively to the Baleka vocals when we play them as our introduction vocal at gigs. Baleka has countless other unofficial remixes from underground producers and DJ’s which made the song and our brand go viral, making it our 1st most popular record. Between 2008 and 09, Sir LSG who was then part of the Hood Natives Crew came to us with a song that would change the history of Hood Natives. At first we organized and EP that went out with remixes from friends like Afrosoul’s deeper mix which was well received at that time. But the EP did not have the Hype and push. Then in 2011 LSG had spoken to GOGO and organized a big release for the tune. Ralph and the rest of the GOGO team loved it and from then, it hit the country with a huge wave, on radio, social networks, CD Compilations, Dj Mixes, everywhere there was sax in the City. Sadly the tune also brought a dark cloud to our brand as that’s around the time we lost Sir LSG, who then went solo. We still regard the song as our most successful and we have big memories from it thanks to Sir LSG. Summer Breeze Tune was released by Soul Candi , The biggest House Music label in SA. Initially it was released on an EP titled Beautiful Joy in 2012. Then it went on Tokzen/DjMthi’s Compilation titled Mzansi vs International which was released by Soul Candi in 2013. Dj Tokzen is a well respected Dj in SA. What we love about the tune is the amount of airplay it got from YFM, Metro FM and other radio stations around the country, it brings us good memories. Working with Dj Ganyani was dream come true!! He is one of the most respected figures in the SA music Industry. He is known and praised for growing the art of DJing and growing the House Culture alongside legends like Dj Cristos, Vinny da Vincy, Dj Fresh and Glen Lewis. Namupenza is a song we did together with him at the GE Studios in Soweto. “That moment when we laughed and enjoyed production at the studio with a man of his huge statue was definitely the moment of our carrier” says Dj Fale , A&R and Exec. Producer at Hood Natives Productions. “ He guided us about the industry, making beats/music and respecting the art, that’s why we will always cherish those moments with him “. Namupenza is part of the SAMA (South African Music Awards) Nominated album The Family 1st Gathering, which was nominated in 2012 for the Best Dance Album alongside Micasa and others. One song we respect! Native Craft is a single from our debut Album titled Hood Nation Vol1 which was released in 2013 exclusively on Traxsource.com. House Music Legendary Producer and DJ, Osunlade from Yoruba Records picked it up and started playing it. Friends of ours from around the globe then started sending us mails notifying us about it , saying good things about it, saying they have heard Osunlade play it. This helped us with downloads and people started supporting Native Craft and also pushed our Hood Nation Vol1 Album which continues to get the amazing support with downloads.